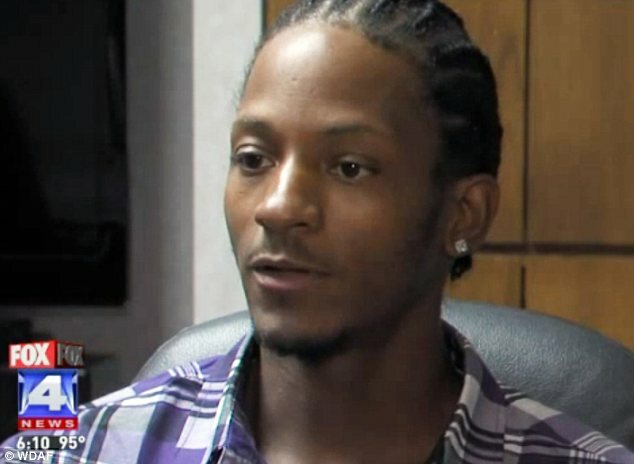 (Scroll down for video) Andre Bowman, 30, from Kansas City Missouri was high on PCP when he fell out of a moving car. He then got run over by the vehicle behind him who did not realize that the man just fell to the floor. The accident happened around 2 p.m. on Saturday near I-70 & Blue Ridge Cutoff. Some passing drivers stopped to help him as he appeared to be seriously hurt. One couple, Sarah Morris and Matthew Nicotra, which stopped to help him had their two babies in the backseat of their car. All of a sudden the injured man got up and ran to the couple’s car and he tried to kidnap their 2-month-old-baby girl who was inside her car seat. “He was trying to grab her out of the back seat, I got out, grabbed him, told him let go of my daughter and he wouldn’t let go,” said the baby’s father Matthew Nicotra. “The parents kept yelling at him and pulling the car seat so he couldn’t take the baby, that’s when other drivers stepped in to help.” said one onlooker. Friends of Bowman however say that he is a victim himself. The man was left heartbroken after his 18-month-old daughter Ada, was killed last month by her mother’s boyfriend. The boyfriend, 24-year -old Bryant L. Sykes Jr., admitted to throwing the girl up against the wall. The mother and her boyfriend are facing charges in the death of the young girl. The man is trying to get custody of his other two children Angelicia, 2, and Amileo, 3, but this incident might end his chances of getting custody of his kids. His friends believe that he was not trying to hurt the baby. They believe that the little girl in the car reminded him of his daughter and he snapped. As of now, the suspect is in the hospital pending charges of attempted child abduction.